Vulture @ the wheel And so we come full circle. Back in 2009 The Reg’s very first ‘leccy car review took a gander at the Mitsubishi i-MiEV. That was essentially just a technology demonstrator and much of that technology has now cropped up in the Outlander PHEV, a plug-in hybrid which, judging by the number I've seen on the roads and Mitsubishi UK's recent claim to have flogged over 10,000 of the things, is Britain's best-selling electric vehicle by some margin. 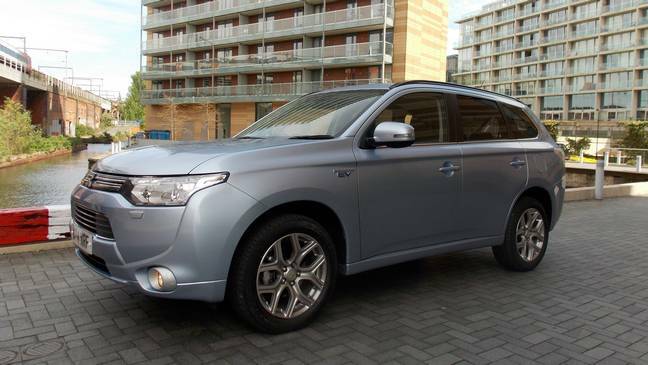 Badging aside, there is little to distinguish the rather anonymous Outlander PHEV from its diesel brethren. Underneath, though, the conventional drivetrain has been replaced by a 230Kg Li-ion battery pack (directly developed from the battery used in the iMiEV), two 60kW electric motors – one hooked up to each axle – and a 119bhp/89kW two-litre petrol engine that’s connected to the front wheels by a GKN eTransmission with a hydraulic clutch. What all that means is that like BMW’s i8 plug-in, the Outlander PHEV can function in a number of different ways. It can move using the electric motors and only the mains-sourced power in the 12kWh drive battery. Or using just the electric motors but with the petrol engine running as a generator to power them and charge the battery pack. In both these modes, the car runs predominantly in four-wheel drive. At higher speeds it is also possible to run in front-wheel drive mode with the petrol engine directly powering the front wheels. In this mode, the electric motors just chime in when extra power is required for acceleration or if things get slippery and all-wheel drive is required. Again, as per the i8, it’s difficult to work out exactly what is happening and when, unless you are looking at the power flow graphic rather than at the road ahead. 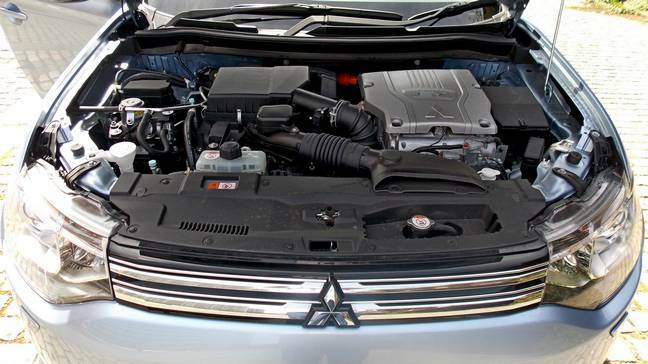 The Outlander can run as a series or parallel hybrid or as a pure EV and aside from the muted hum of the counterbalanced four-pot engine, you’ll not be able to tell which from behind the wheel. If you want to second-guess the Outlander, you can stick it into permanent four-wheel-drive mode – handy on a slippery A-road or for a spot of light off-roading – tell it to hold any charge in the traction battery for later use or force the engine to fire up and charge the battery. If you park up and put the system into Charge, it will get the battery up to 80 per cent of capacity in about half an hour, but it will hammer your fuel economy in the process. Running charge mode while on the move is even worse. I have to be honest and admit that I’m not quite sure what the Charge feature is actually for.